Young people from Plasmarl Primary and Clase Primary attended the Liberty stadium to take part in our educational club event with Swansea City FC for the day. Former Swans player Steve Jenkins delivered a workshop in the morning to the young people educating them on the topic of racism using interactive activities and discussions. 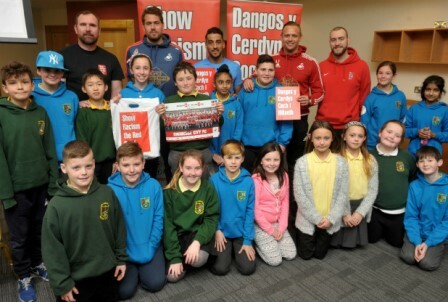 Swans players Neil Taylor and Kristoffer Nordfeldt along with former Swansea player and SRtRC Patron Lee Trundle attended the event to take part in the press conference joined by Steve Jenkins. The best asked question won a signed Swans shirt and a SRtRC goodie bag. SRtRC Patron Lee Trundle gave his full backing to the day. He said: "It's important that we educate our youngsters about racism and the damage it can do to people. "The kids are our future and we need to get in there early and get them thinking about these things. "On a football team you have people from different backgrounds and religions but you are all one team playing together. "I've been involved in these events for years and they are really important — it's great to get the kids together to educate them, and get them thinking about language and what is acceptable and what is not." Campaign worker Jason Webber said: "The children were really engaged in what they were doing with the players and in the workshops. "Using sport, and especially football, is a great way of connecting with young people and educating them about racism." “Both Lee and Neil Taylor have attended a number of our club event now and it’s fantastic to have their continued support.